Over the past five years, developers have created hundreds of projects with Blockly, our open source library for creating block-based coding experiences. 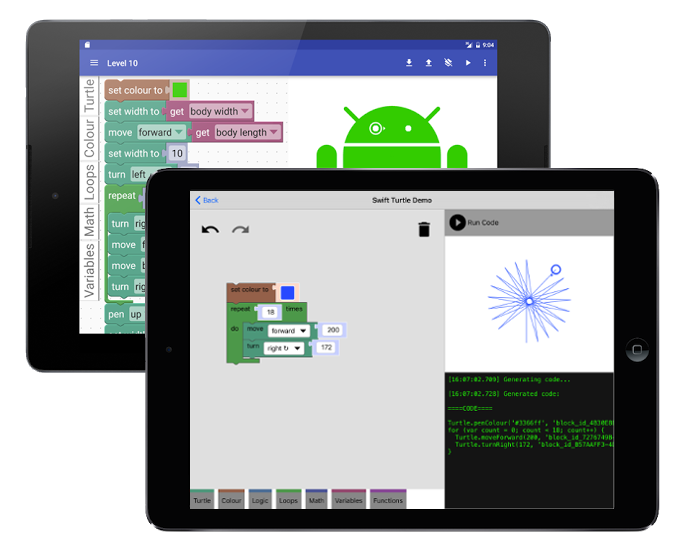 These have ranged from education platforms like Code.org to electronics kits like littleBits and even Android app creation tools like MIT App Inventor. Last year, we also announced our collaboration with the Scratch Team to develop Scratch Blocks—a fork of Blockly optimized for creating coding apps for kids. While our 1.0 update today is focused on native mobile, we've also made several updates to the web project over the past six months. We've made major improvements to performance and testing, added more structured APIs, and improved touch support for the mobile web. In addition, we improved Internet Explorer and Edge support; Blockly is fully supported on IE10+. We've done a lot of work to ease cross platform development, too! All blocks can now be defined by JSON, allowing a single set of block definitions to be used for web, iOS, and Android. Check out the documentation for more details on all three platforms. Get started right away with our iOS Codelab (Android coming soon)! To learn more about Blockly, check out the above intro video, visit our developer site, join our mailing list, or jump right into the code for web, Android, or iOS.